If you haven’t had an opportunity to experience the PERCEPTIONS exhibition at the Hofheimer Gallery, there are still a few days left. “Perceptions” will close on Tuesday, May 29th. The show presents the work of four Chicago area Artists—Julia Katz, Deanna Krueger, Rebecca Moy and myself. Each artist offers his or her own point-of-view of visual abstraction created through a unique physical or creative process. 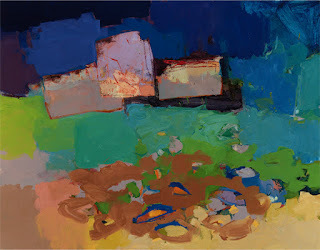 Julia Katz [work shown above] is known for her bold use of rich color and fluid paint strokes. Through focused observations of the environment, Katz creates loosely-facetted forms of hues alluding to nature. She produces her imagery—documenting the details of light, shadow and subtle movement. 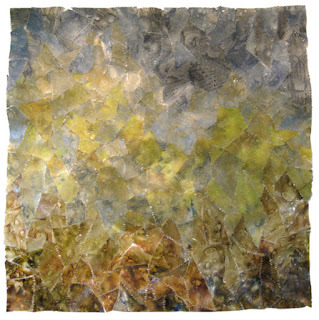 Deanna Krueger "Lichen at Brush Creek"
Deanna Krueger's work conveys some of the same visual elements of Katz but Krueger's work is much more about unique materials. Krueger manipulates medical diagnostic film to create large-format wall pieces that exist somewhere between a two-dimensional painting and three-dimensional sculpture. She applies loose layers of paint over the film and then shreds the visual evidence of the medical findings. 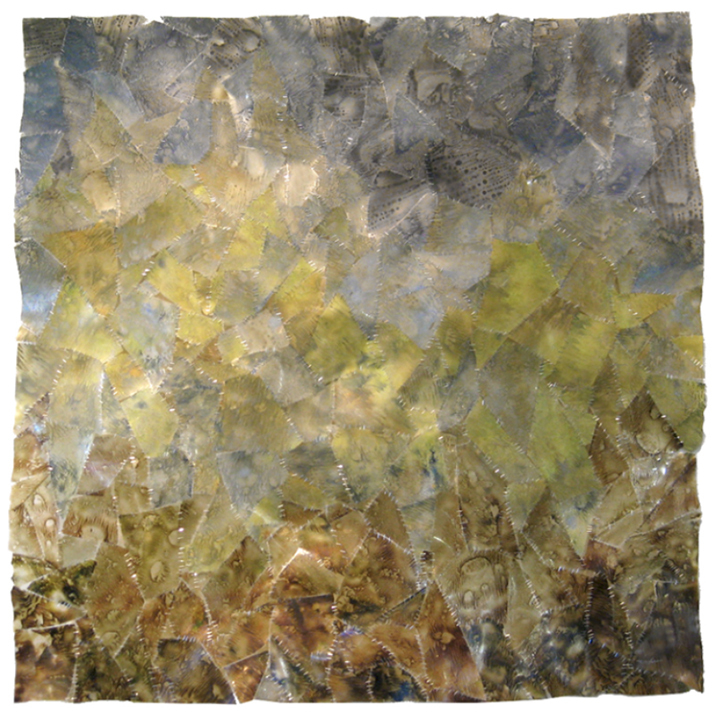 The film is painted, torn, repositioned, and then stapled together to create beautifully semi-reflective multi-faceted surface. The surface creates a shimmering, gem-like appearance reminiscent of the flickering mosaics. The same visual complexity is also apparent in the work of Rebecca Moy. The fine line between graphic and fine art is explored in the lyrical work of Rebecca Moy. Her bold use of color is heightened by a flat linier element that flows through and around seemingly architectural structures. The interaction of bold flat shape with mystical color gradients, offers the viewer a unique environment to explore. Over the years, Rebecca and I have discussed a possible collaboration—merging our styles to produce a hybrid. It came up again at the Hofheimer opening reception. We'll see what happens. PERCEPTIONS will conclude on Tuesday, May 29th. The Hofheimer Gallery is located at 4823 N. Damen, Chicago, IL. 60625—on the north side of Chicago in the Ravenswood area at Damen and Lawrence. The gallery is dedicated to introducing contemporary fine art in painting, drawing and sculpture from established and emerging artists. Through the year the gallery will feature provocative, engaging, solo and group exhibitions. Charles Gniech is an Associate Professor of Graphic Design at Joliet Junior College and has been teaching at various colleges and universities for more than twenty-five years. Gniech served as Curator for the galleries of The Illinois Institute of Art-Chicago from 2002-2013 and acted as the Collections Curator for the Institute’s Corporate Fine Art Collection. He holds a Master of Fine Art degree with an emphasis in painting and a Bachelor of Fine Arts degree with an emphasis in illustration, both from Northern Illinois University. 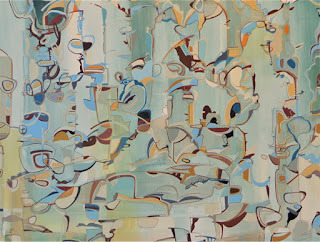 While teaching, curating, and consulting, Gniech continues to paint and exhibits at the national level. His work has been included into numerous gallery and museum exhibitions—repeatedly included at both The Rockford Art Museum and The Fort Wayne Museum of Art. Gniech’s paintings have been acquired for multiple public and private collections, including the permanent collections of The Fort Wayne Museum of Art and Purdue University. Grounded • acrylic on canvas • detail • 60x40"